There was water everywhere but there. The lookout suggested that me destination was quite away from the lake but was somehow still named lakeside. "Oh well", I said, "What's in a name?" I ordered the crew to drop the anchor lest we risk running ashore. Walking quite a bit on the land, I spotted a fellow Captain who waved at me. Behind him stood our current destination, Mini Punjab's Lake Side. 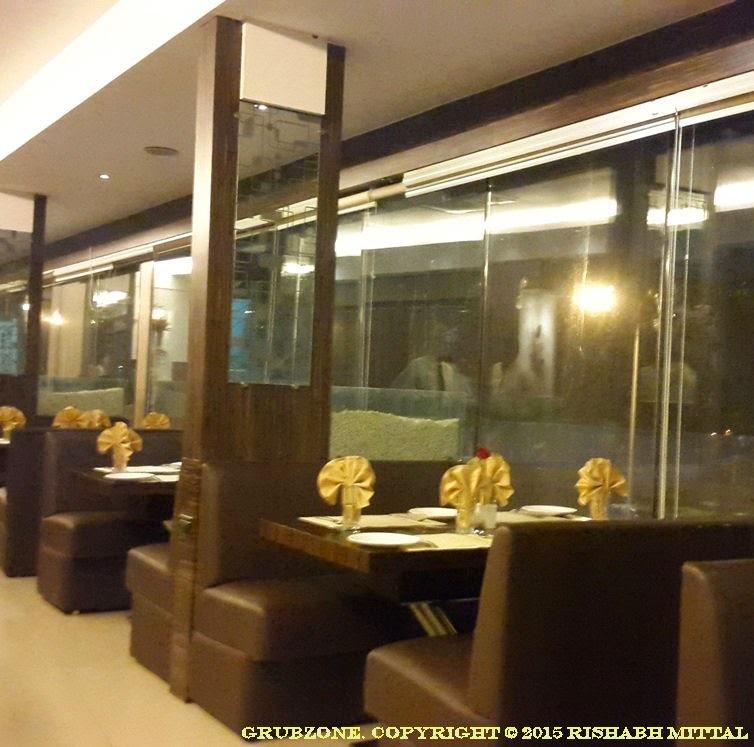 Mini Punjab intimidates most diners with its sheer size - Two indoor floors of casual dining halls and a terrace based roof top restaurant too. And to add to all of it, it has been around for several years. This goes on to show that it has a steady and a large clientele. What the food is and how it tastes however is a very personal matter for everyone including myself. 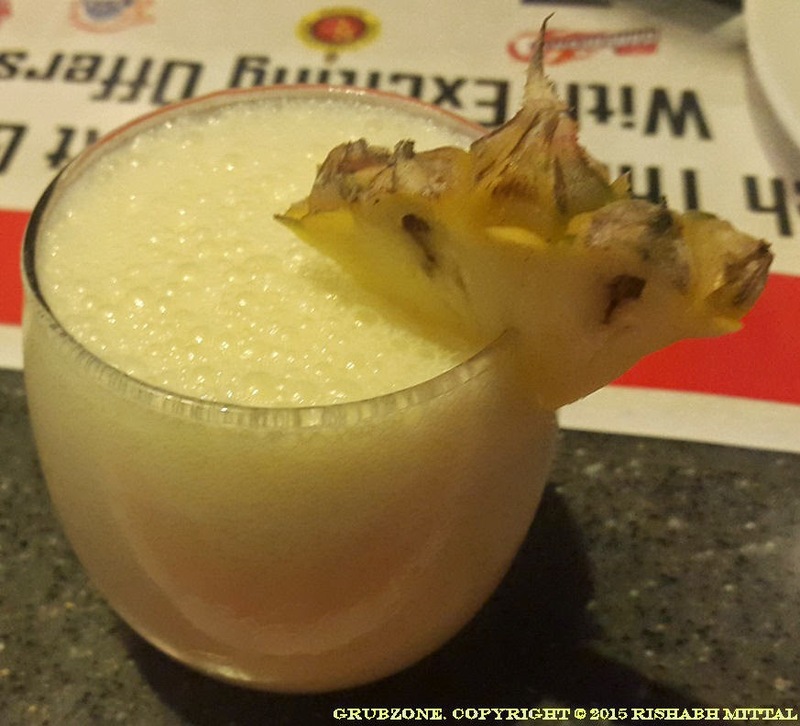 Despite the decent ambiance and its long track record, I found the food quite mediocre. While the starters were great, the mains were not very satisfying. The ambiance appeared fairly spartan with a lot of tables appearing in a communal fashion in the main dining hall. The place is known for its buffets so it did have the appearance of a banquet hall or a place where mass meal parties are conducted. We were thankfully not seated here and instead directed to a side structure segregated from the main restaurant. This looked like a narrow passage with a much more comfortable ambiance. The glass windows overlooked the busy road and not the lake. The restaurant's name is sadly a misnomer. It could very well do as just Mini Punjab. This was a meet of the epicurean sort. I met a few food writers and we chatted over dinner. Due to the presence of friends and friendly strangers over the table, my experience was ultimately a good one. But the food had a very little part to play in it. The evening tale began with a Lassi. 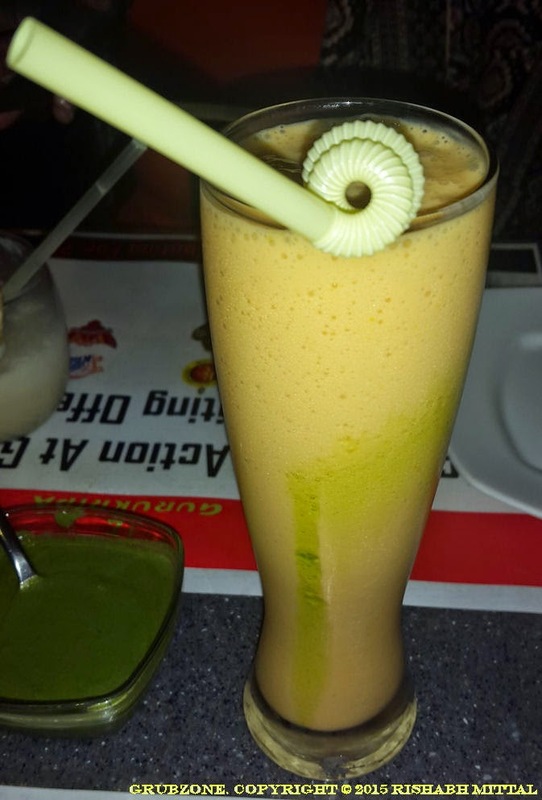 It was served in a very unpunjabi glass so to say but the beverage itself was quite good. 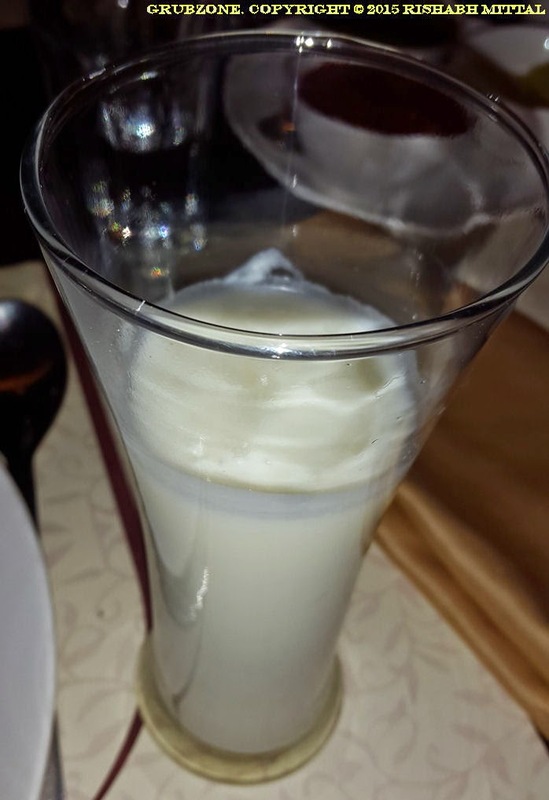 The Lassi was thick and creamy. The taste was sweet with hints of a citric sourness. It was not watery and was better than most Lassis that I have had. Captain : This is quite creamy. Make my heart all screamy. Crewmate : It also made you older. Crewmate : You got a Lassi mustache on you Captain. 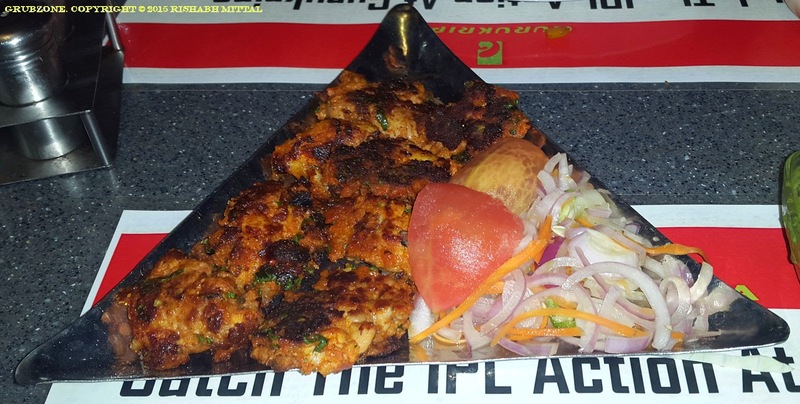 Chicken Supreme Kebabs go on to show that creativity is always rewarding. These were made out of barbecued chicken and the crevices were filled with liquid gooey cheese. One bite and one could trigger an avalanche of liquid cheese which would ooze out of the preparation. The crust was crispy and loaded with the right amount of spices. The upper crust combined with the cheesy core was a pure bliss. Very addicting and definitely the best item of the night. This was a fusion food created by the house. Captain: These are so tasty, that they land me in ecstasy. Crewmate : That Rhyme is quite cheesy. 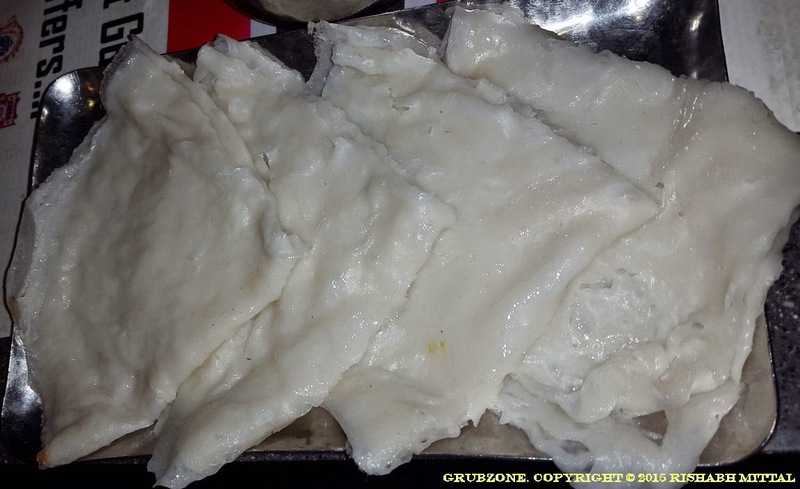 Fish Koliwada were average snacks which were made from sea fish. (Thankfully not the over used Fresh water Basa.) These were deep fried and coated with a batter. Had a great appearance with their texture. However, they felt a bit tough and leathery to me. There was very little inherent flavor and I had to use a lot of Mint Chutney to make amends. 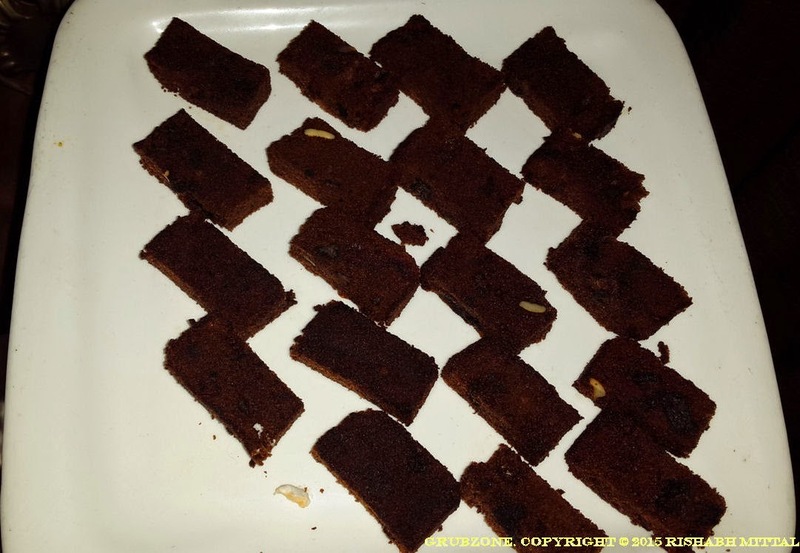 Although this appeared to be an issue with that particular platter, the next batch had softer chunks as opposed to the tough ones in the previous platter. The restaurant could very well improve on the consistency of the grub. Captain : Finally, some sea fish. I was beginning to think that they no longer exist. Crewmate : This preparation feels tougher than what we have had before. Captain : Maybe the cook needs to explore the sea more. 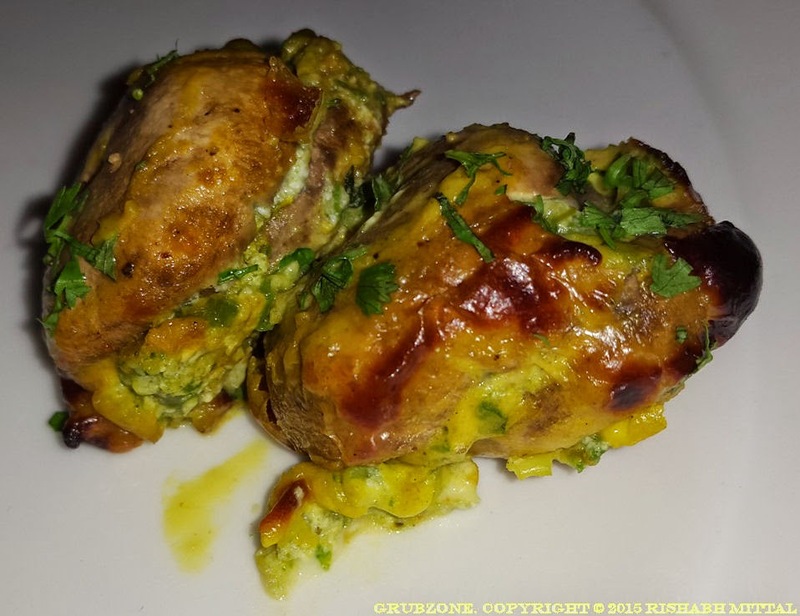 Stuffed Tandoori Mushroom - One could stuff almost anything in a mushroom cap and make something edible out of it. However, the skill in making something good out of it varies from place to place. Mini Punjab's variant was decent. These were savory, a tad bit cheesy and flavorsome. The fleshiness of the mushroom caps with the stuffing inside made it a very great dish for a carnivore eating vegetarian. 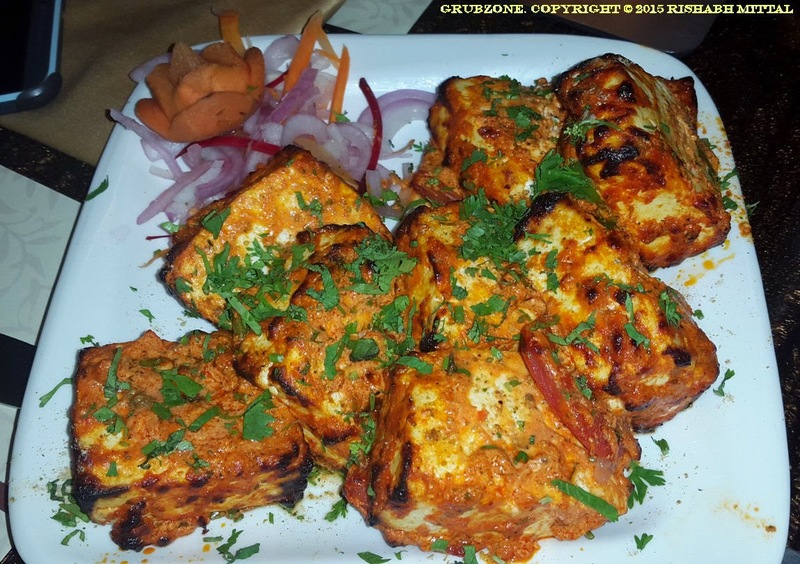 Paneer Tikka was a visibly enticing dish with a lovely aroma. 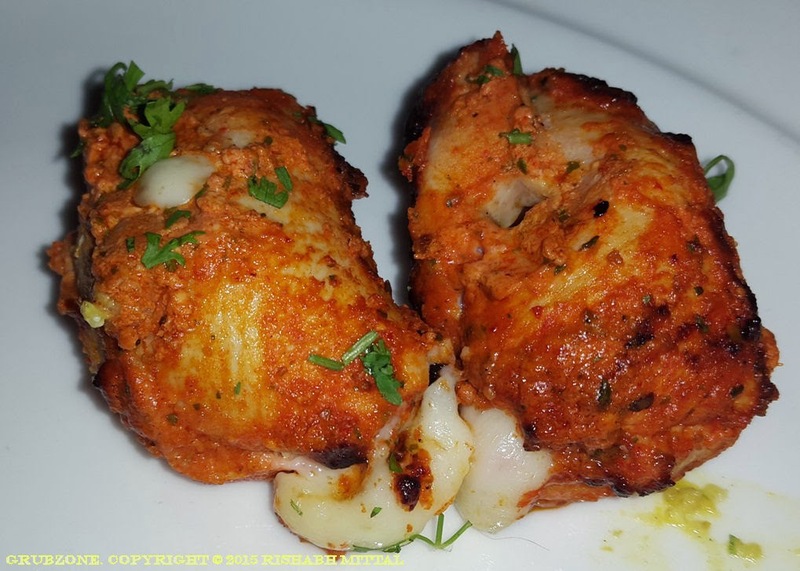 Marinated in spices and grilled in a Tandoor, this was quite a tasty morsel of a starter. Though not the best by a long shot, I do feel that Mini Punjab's variant was quite good. The roasting was uniform and no part of the cottage cheese chunks was burnt or hardened in the process. 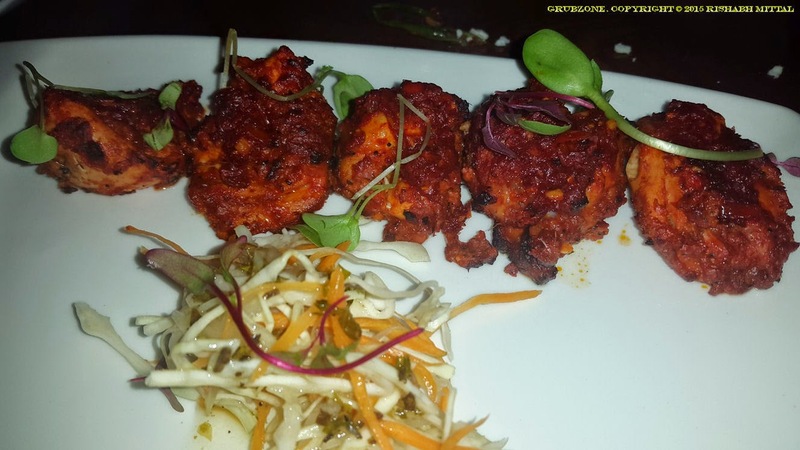 This is the closest thing to a Chicken Tikka for a pure vegetarian. While the Starters were an overall decent experience, the mains sadly failed to satiate the taste buds. Often mistook to be a Mughlai/North Indian preparation. 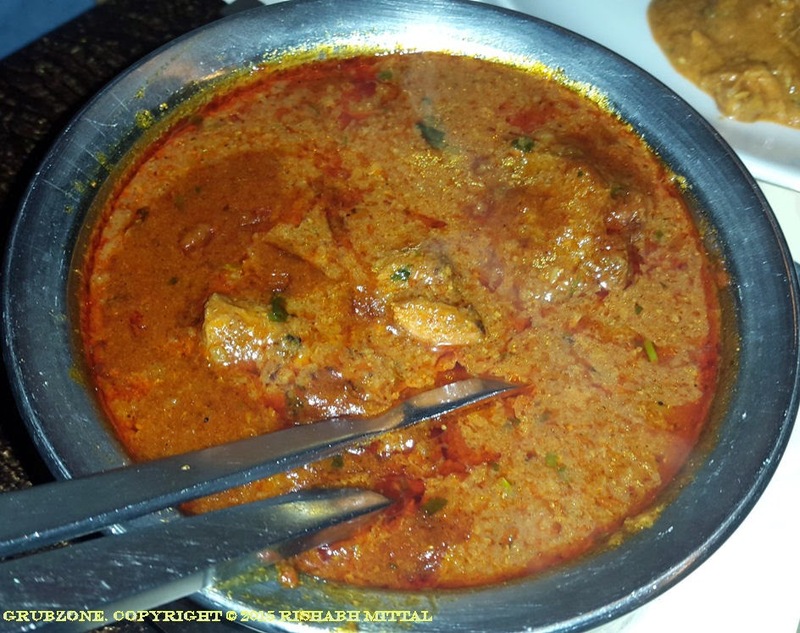 Rogan Josh is actually a Kashmiri Lamb dish. 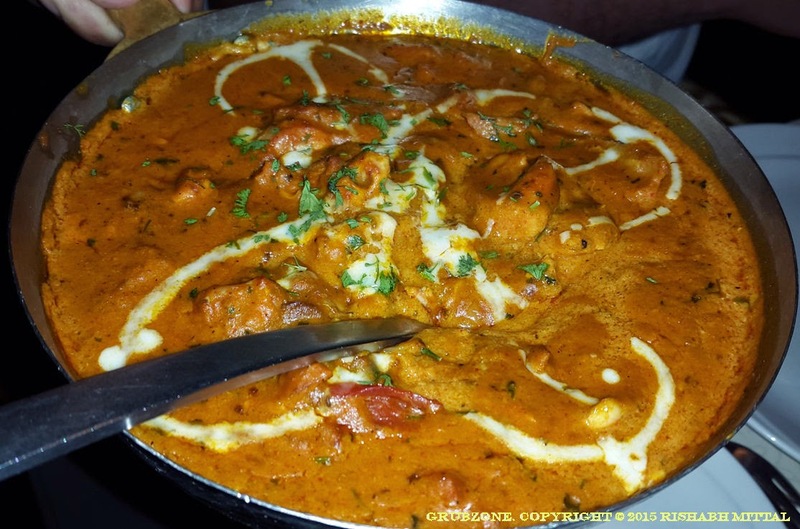 It was probably assimilated into Punjabi cuisine when the Sikh emperors ruled Kashmir. This dish is always a fine balance of meat, bones and flavor. While Mini Punjabs variant scored in flavor and aromas, for me it lost on bones and meat. Though my friend found it good, I found it more bone than meat on my servings. The enticing aroma and tasty meat meant very little when I had to wrestle small bits of meat off a large piece of bone. Such effort often turns off the appetite. Chicken Amritsari looked visibly pleasing upon arrival. One has to give the chef points for working on excellent presentations. The taste however felt quite a bit off. It was absolutely devoid of any spices or masala. Though Chicken Amritsari does not traditionally have too many hot spices but a light flavor from hot spices is still an absolute must. While Mini Punjab's preparation was definitely North Indian, it wasn't quite the classical Chicken Amritsari. 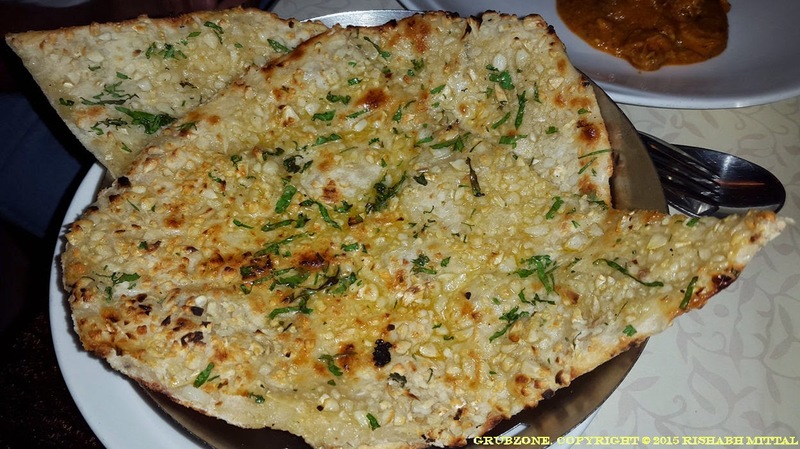 The Garlic Naan was a bit too buttery but was quite tasty nonetheless. It helped me finish my small servings of the mains. More Naan, less main. The desserts looked colorful and nice but once again the taste was below average. The plum cake was very ordinary and crumby. It was much similar to the cakes found in Iyengar bakeries. The mango pastry was a bit over sweet and despite its glazed cream and regal appearance, I found it to be my least favorite amongst the desserts. 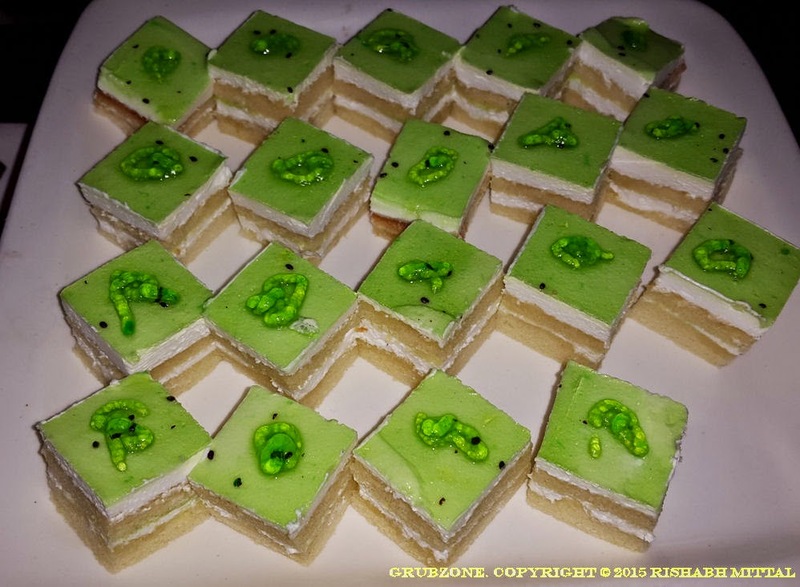 This Kiwi cream pastry looked great and tasted well. Although not as well as its appearance would suggest. Captain : These look amazing lad. Crewmate : Funny thing food coloring be. One extra drop of green and it goes from pleasant to toothpaste green. 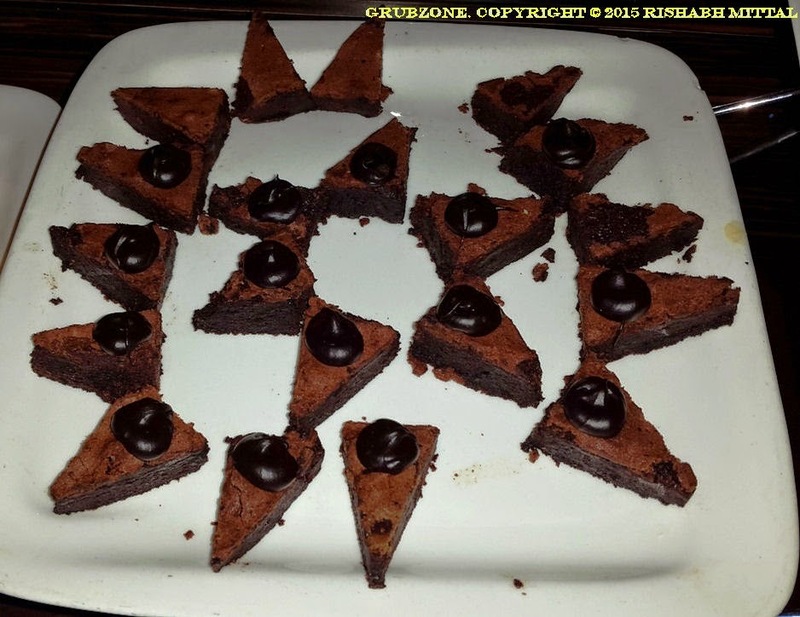 The Gooey Chocolate cake had a brownie like appearance and lacked sweetness and firmness in the core. Maybe some extra sugar from the Mango pastry could have been added here. 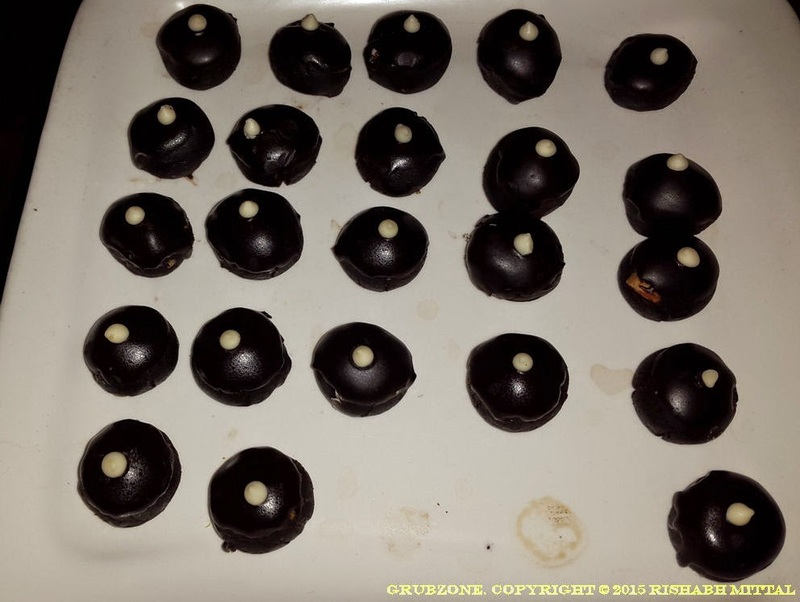 These Chocolate balls though not the best, were the only desserts that I found palatable. The sweetness was right and the chocolate core tasted authentic. They bounced well with me so to say. The service was acceptable. Cannot say that it was stellar since the servers would often understand instructions slowly. Thankfully the Captain was smarter and sharper as he insured a decent experience. The pricing appears to be a tad bit more than the standard North Indian places that I find all over Mumbai. But all said and done, the prices are acceptable and suit most patrons. 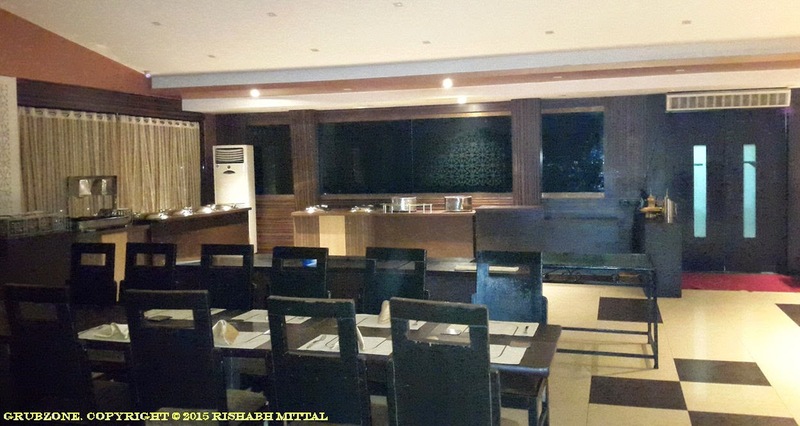 The restaurant boasts of high clientele and thus I feel that the prices are not a problem. To conclude, I shall say that I was somehow satisfied with the Mini Punjab experience. But for a full scaled North Indian restaurant, it certainly needs work on its mains. 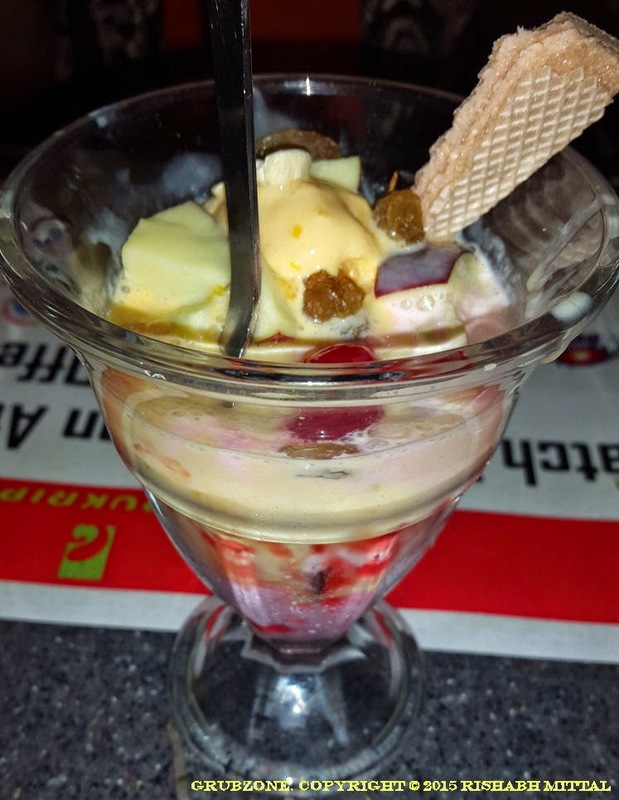 The desserts have a large diversity which is nice but then the flavors are very meek which is not quite nice. "Lets find that lake before we leave lads. Then its back to sea for us." I sat bored in me bridge as the ship traveled through well known routes. The quartermaster suddenly barged in looking all zealous. His eyes suggested that he had seen something new. I quietly followed him out and he handed me my looking glass. I looked in the direction that he was pointing at and saw a tavern in the distance. Not just any tavern mind you but the famous Harry's which I last saw in my trips to the Straits of Malacca. "This better be the real deal," I said as we steered our ship towards the closest dock. 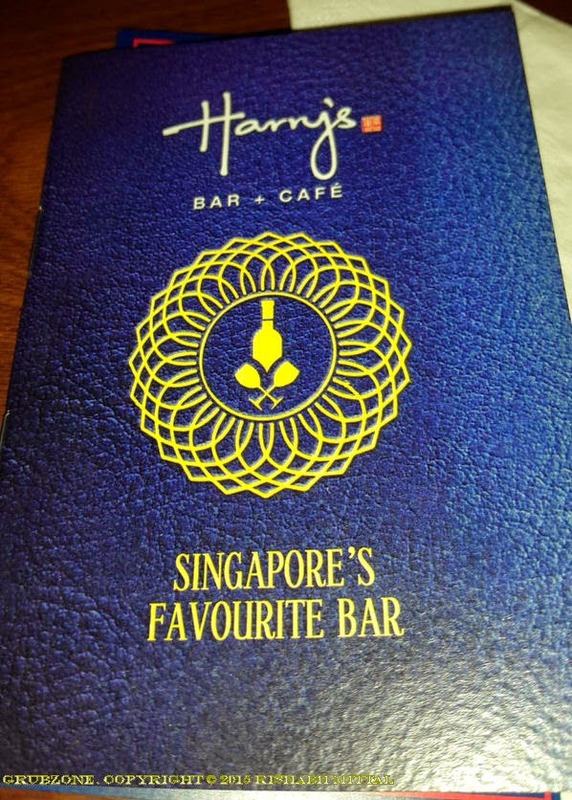 Harry's Bar + Cafe is a well known brand in Singapore and has recently opened shop in India. When I first read this outlet's name, I erroneously read it as Harry's Fun Republic(Combining the name of the place its located in) but wow that actually worked to good effect. Friday Evening at Harry's was indeed fun. The ambiance comes off as a classy uptown pub. Indeed, one forgets that they are down in the suburbs when they pass the door. The pub was already full of early evening comers. And thanks to an IPL match on the weekend, a good lot was noisy as well. Dim lit with golden lights, it felt quite cozy to settle in for some evening entertainment. The pub feels very western and has everything one would expect from it. 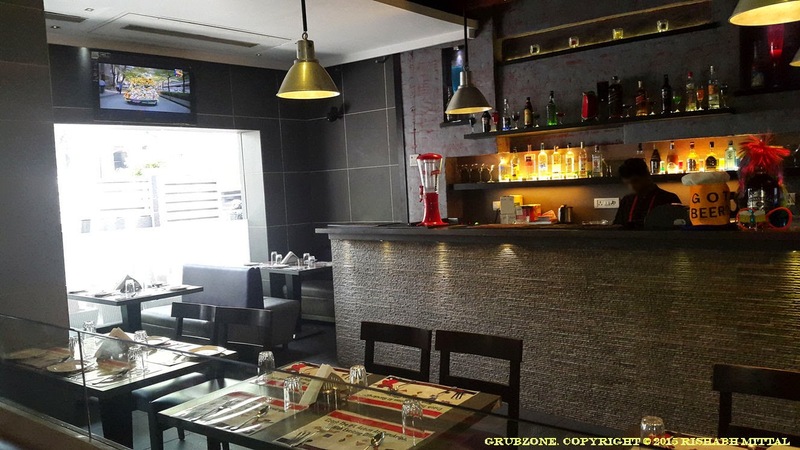 A DJ, a bar counter, a large screen playing the IPL and even a pool table at the end. 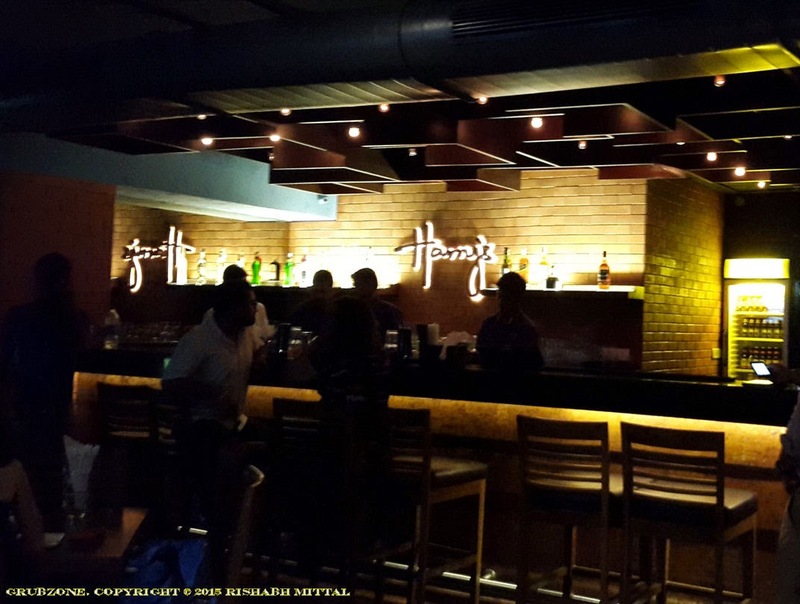 Whether you are alone or chilling with your buddies, Harry's is definitely for a great choice for some grub-grog. As for me, I was part of a Food Bloggers Association of India meetup and had the honor of meeting some of Mumbai's finest food bloggers. And the evening reached stellar heights with the presence of celebrated Chef Vicky Ratnani (Vicky Goes Veg fame) who joined our table. This be the passport to Fun. Moving on to Grog and Grub. Harry's has a large number of beverages including a large selection of wines. 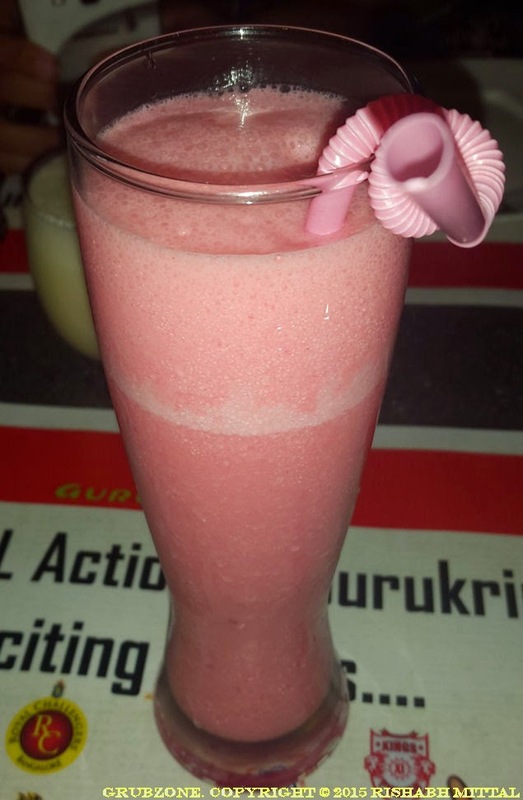 There is also a large number of popular cocktails. But what a shame it would be if I don't try the house specialty - "The Singapore Sling". Slingshot into divine oblivion with this sling. 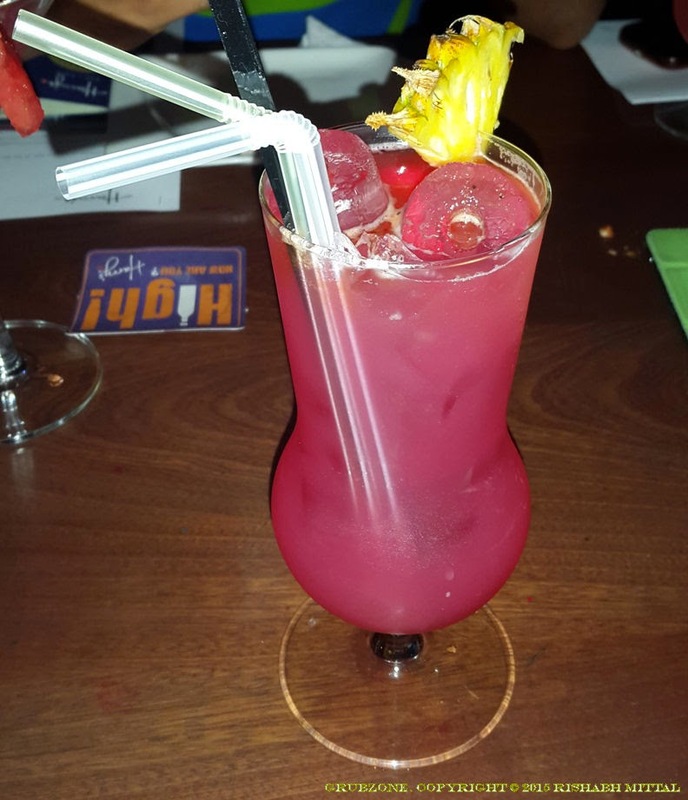 Made with a blend of Cointreau, Cherry Liqueur and pineapple juice - This is a mild cocktail that feels very tropical. Do note that the drinks were served with Marinated Olives and Feta in a jar. This item was mildly addicting but sadly the dim lighting and its color did not allow me to get a legible picture for the same. Harry's serves quality finger food and expect vast diversity in that as well. We tried a lot of different things, so this will be one colorful post. 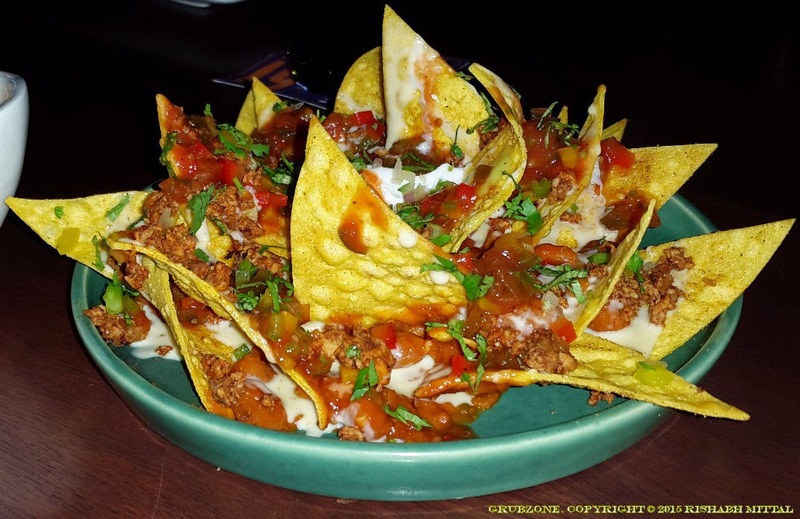 Our Evening started with Muchos Nachos Con Carne, which to be fair tasted well but had Indian influences. The balance of chicken, veggies and spices was good and the nachos weren't soggy. Crispy Chilli Potatoes was one of the stars of the night. These were made with a mix of potato crisps wrapped in chilli and soy. Tangy, addictive and full of flavor. No one can eat just one...plate. Goes well with any drink. Captain : Tangy Matey! I could eat this all night. Crewmate : Better leave some space for the rest of the grub Cappy. Captain : I am quite sure that four plates of this wont hurt my appetite that much. Sichuan Barbeque Chicken was charcoal grilled chicken loaded with spice. While the flavor was great, the extra addition of paprika flakes made it a tad bit too spicy for me. 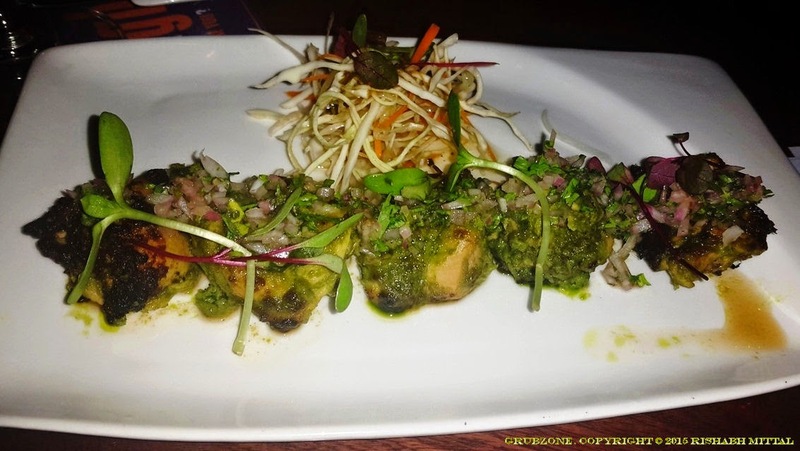 Chimichurri Chicken is an Argentine Chicken dish which is made of grilled chicken. It is then wrapped with Chimichurri sauce. And finally rubbed with extra Coriander and Parsley. This was my first time with this exotic dish from across the oceans. It certainly had a flavor that I had never tasted before. It was aromatic and mystifying. The food universe is vast indeed. Captain : How much do we know about Argentina lad? Crewmate : Football and rough Hockey players. Captain: Add Good grub to the list. 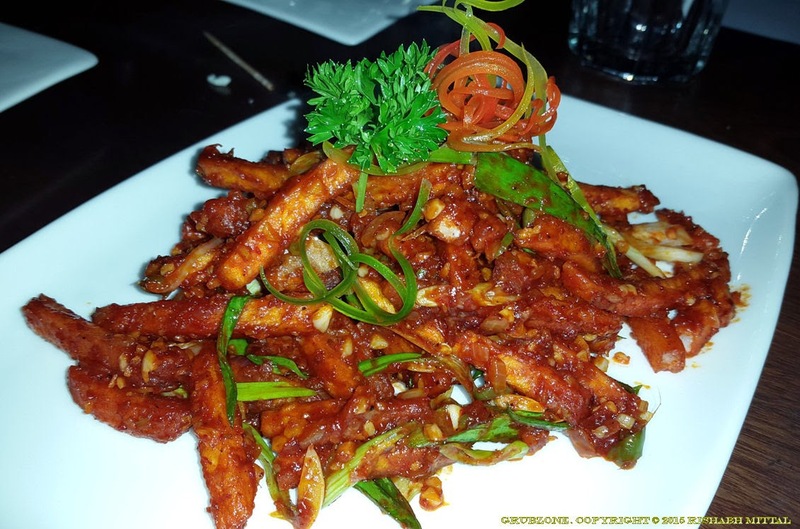 Spicy Chicken Supreme Satay is the ideal Satay as its meant to be. These Big lumpy tender chunks of meat on a skewer were thoroughly satisfying. Many mainstream restaurants in India serve flattened and leathery preparations in the name of Satay. It was pleasing to finally find a place which knows what Satay truly is. The sauces and spices were in the right amount. Crewmate : Captain, where are the Satay sticks? Captain : Here lad, I saved you one. Crewmate : That's mighty generous of you Cappy. What about the rest? 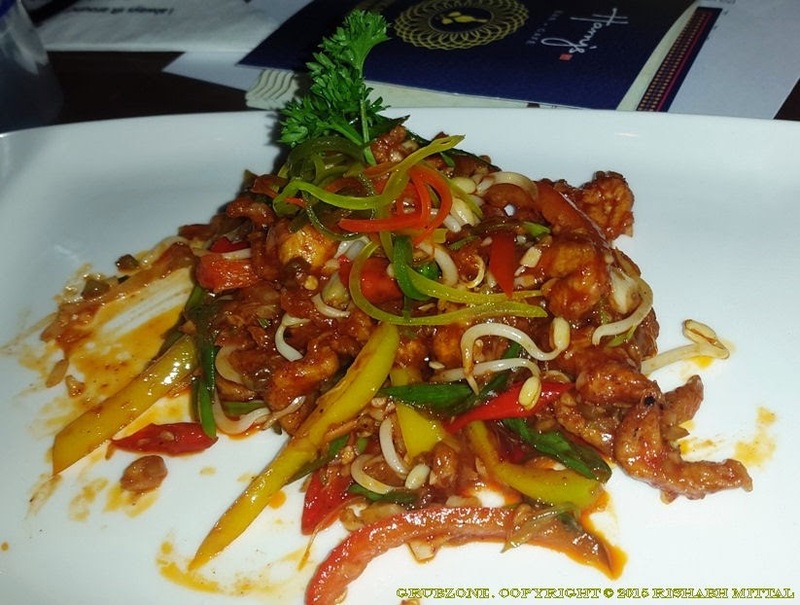 Crispy Chicken was a colorful dish with tender juicy chicken pieces. The color-taste diversity was aided with bell peppers, shallots, sprouts and chilli. The colors and flavors came in well resulting in a dish that was pleasing both to the eye and the tongue. 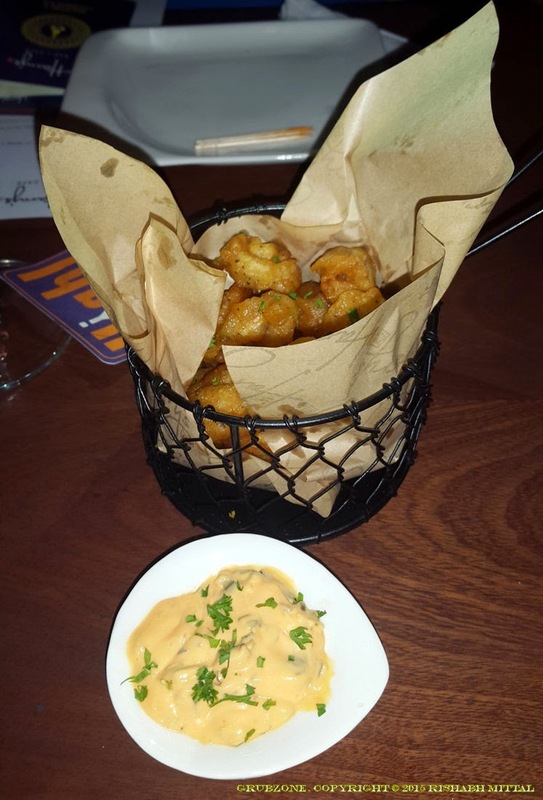 The Fisherman's basket was an assortment of Calamari and prawns wrapped in a crispy batter. These crunchy snacks were served with Remoulade sauce. Again addicting and go well with the drinks. Jamaican Spiced Jerk Chicken was another new for me. This was wrapped in Jerk spice which is usually hot and flavored with Thyme. The minty pleasant flavor of Thyme dominated the item. The chicken was tender and succulent. The plating was top notch as well. Crewmate : I wonder if we will find this in the Caribbean? Captain : Yes and because all sailors must mention the Caribbean at some point of their journey. 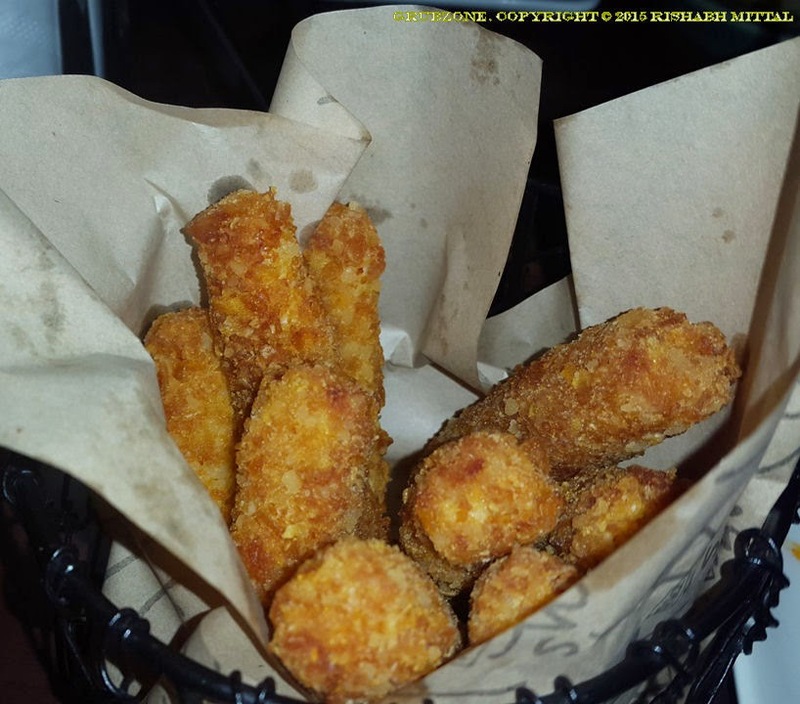 Paneer Fingers was a vegetarian take on the classic Fish fingers. This was a very ordinary item and was bland on its own. Thankfully, the provided dip helped provide taste. 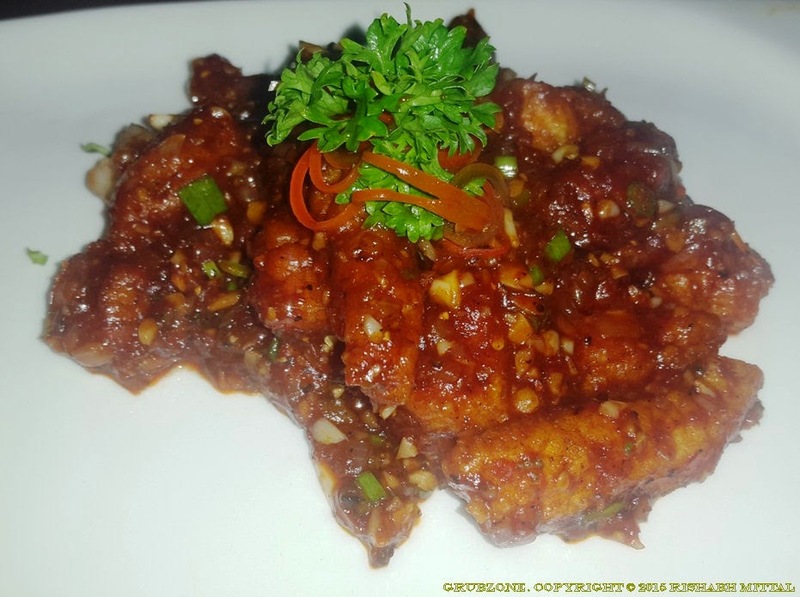 Pattaya Beach Fish Goujons was a spicy and flavorsome preparation of Basa with garlic and Soy. 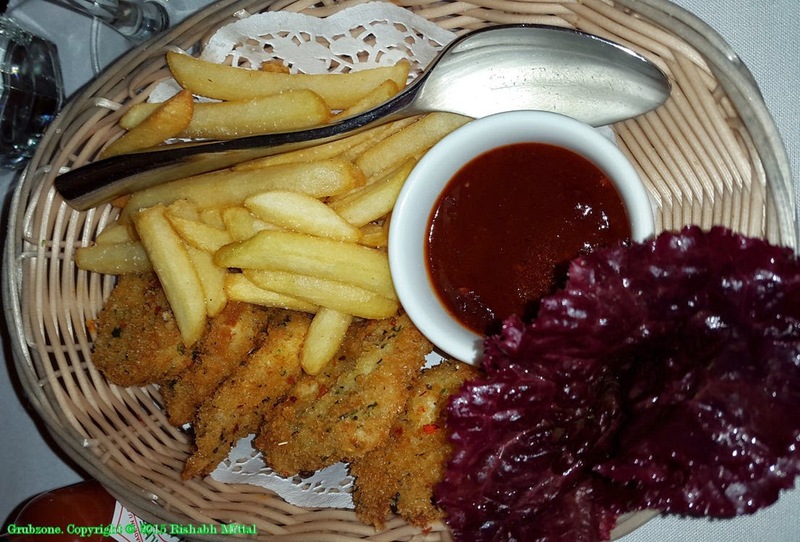 Though the overuse of Basa in Mumbai eateries has been a troublesome thing for me, the Basa here was cooked to perfection and complimented well with the sauces. This is one of the few Basa preparations that I have come to love. It was so good that I would have been happy to have ONLY THIS all evening. Yes, that good. Ratatouille stuffed mushroom caps - Long before the movie popularized the word, it always stood for Ratatouille Niçoise. 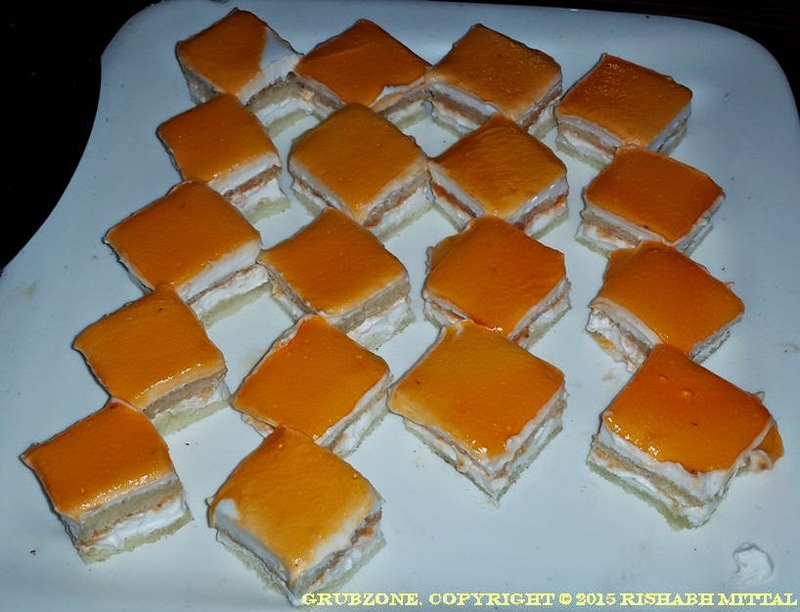 It is one of the few vegetarian dishes found in the west and a popular French delicacy. 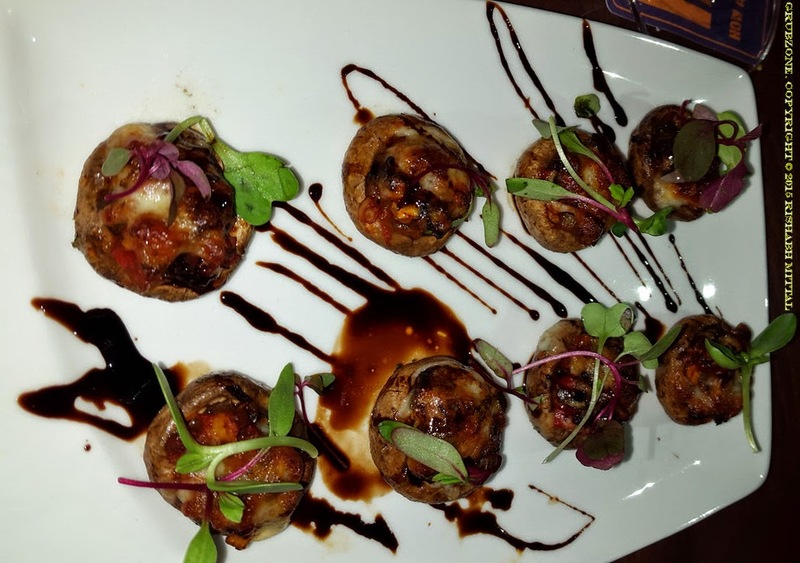 Harry's converted it to a Finger food variant by stuffing the dish inside Mushroom caps. Although I doubt that it would be an exact replica of the French Delicacy, it was certainly a good dish and my vegetarian friends went through it like Pacman on power pills. Captain : I don't like food, I love it. Crewmate : Did you know that the word Ratatouille wasn't invented by that movie? Captain : Of course not, the movie was based on a real life story right? 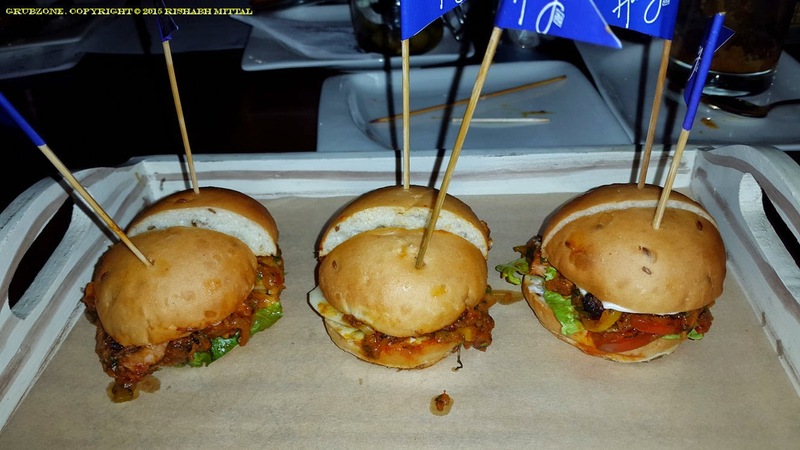 Tandoori Chicken and Thyme Sliders were a trio of Mini burgers in a big world. I felt that the flavors did not sync in properly with this one. 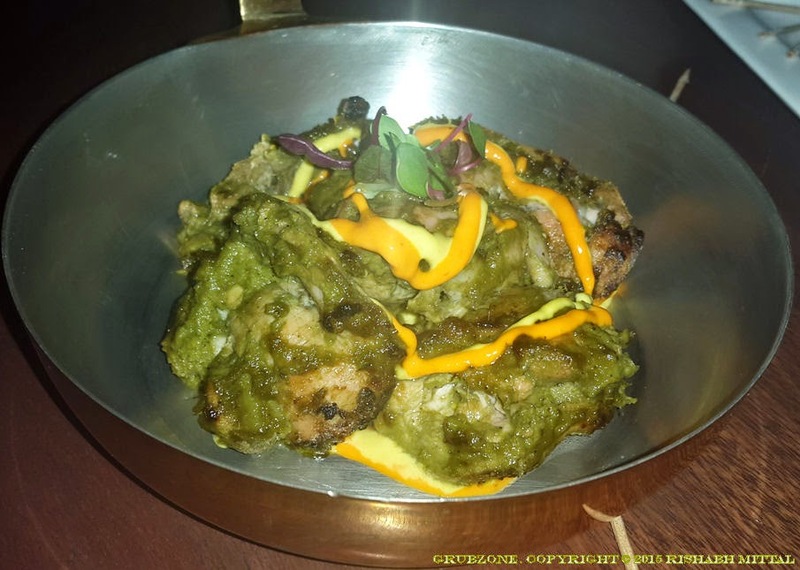 The Thyme intruded with the flavor of Tandoori Chicken and the result was not a likeable one. Too many flavors killing each other. Spicy Potato and Bean Sliders were a tad bit better than their chicken counterparts. The flavor reminded me of home cooked Sukhe Aloo. It even had cumin inside. 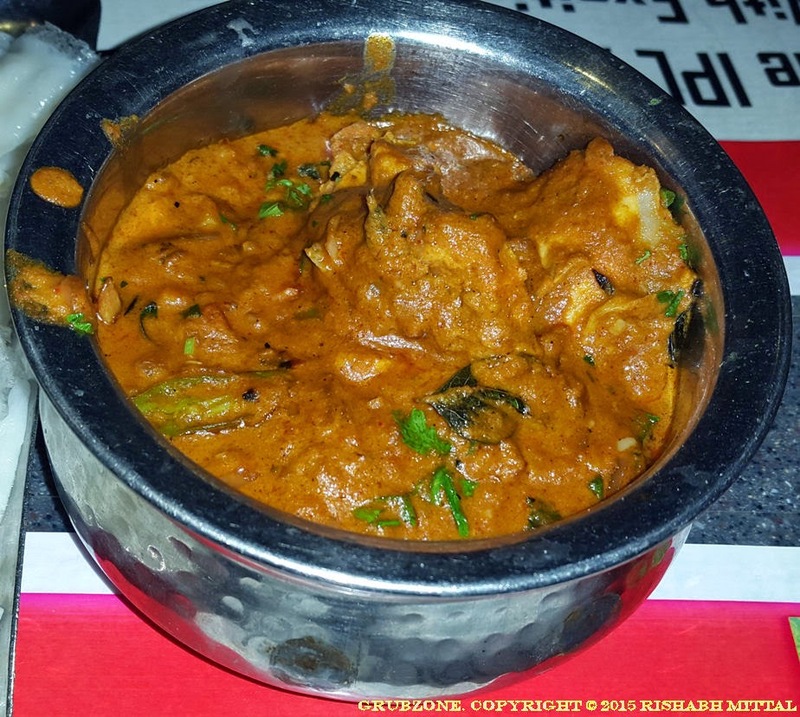 As I am not too fond of Sukhe Aloo, the flavor did not please me much. However, my vegetarian friend on the other side of the table gobbled these up pretty fast. 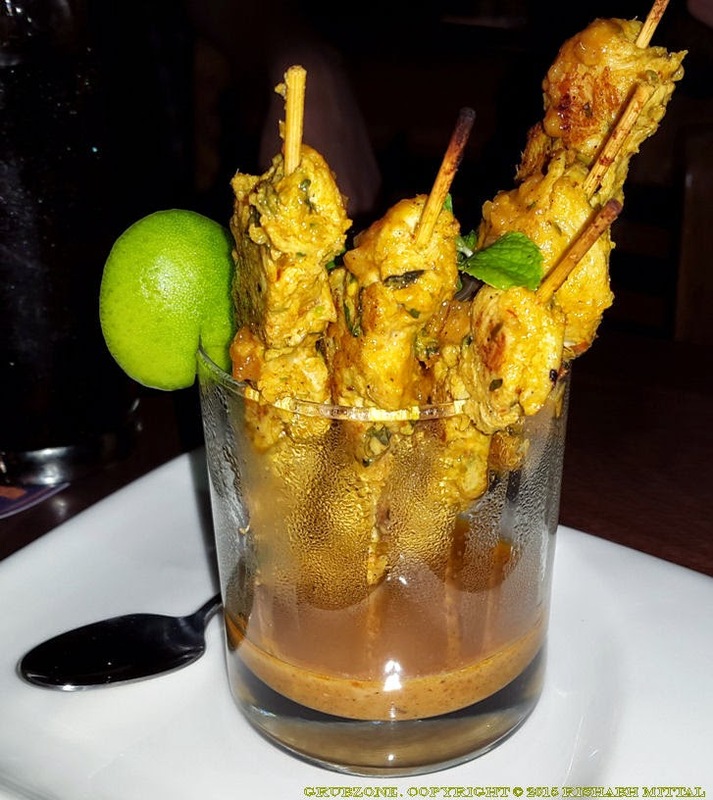 Singaporean Chicken Lollipops were tasty and juicy morsels wrapped with Sichuan Garlic sauce,sprinkled with Lemongrass and enhanced with Galangal. These were some of the best Chicken lollipops that I have ever had. The meat easily came off the bone and there was quite a lot of it on each Lollipop. It had an appetizing aroma and a fulfilling taste. A self sustaining and wonderful combination. Carnivores absolutely must go for this. 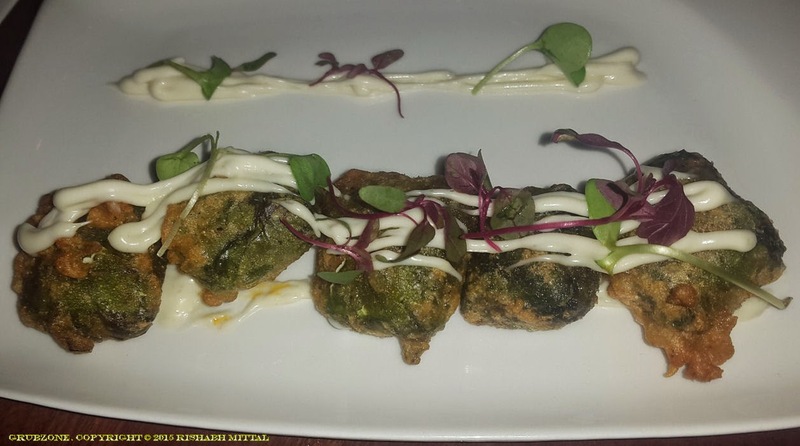 Wasabi Cottage Cheese cubes or Wasabi Paneer was a savory preparation of Paneer, Spinach and Wasabi. While I did enjoy this dish, I felt that either the Wasabi was too less or absent since my taste buds found no trace of the typical Wasabi zing. It was more spinachy, if there is such a word. 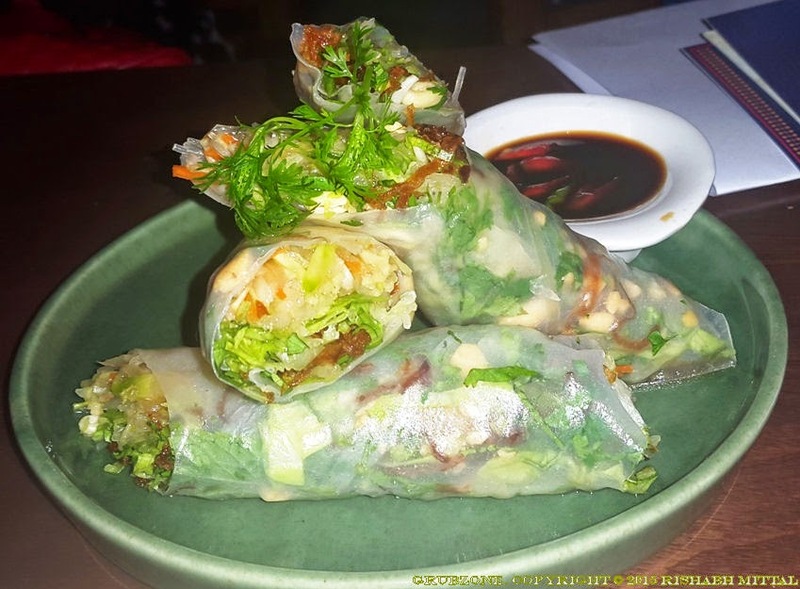 Vietnamese Spring Rolls were visibly pleasing and transparent Spring rolls. However, the flavor of this item was too flat and it was quite soggy. It was perhaps the only dish that I found myself disliking completely in my Harry's experience. Fondue Stuffed Mushroom was visibly similar to the Ratatouille. However, it had cheddar cheese stuffed in mushroom caps and was laced with spring onion sauce and paprika. The flavor was very ordinary for this one. It was lacking the zest that it was supposed to have and the flavor was largely overpowered by the sauces. Although, Harry's does have quite a few mains. Its principal serving is the finger food and drinks. 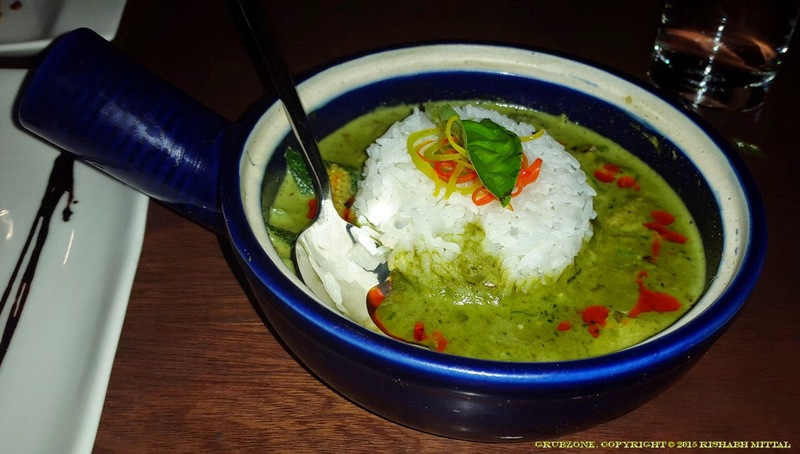 Nonetheless, our group decided to try Thai Green Curry. The curry looked beautiful to the eye and it tasted equally well. This was the vegetarian variant and as a carnivore I found it pretty good. Sadly, I was full and could not relish it more but that's definitely a thing to do for my next Harry's trip. The Dessert that marked the end of the grub session was the Drunken Volcano Cake. Harry's doesn't have a wide diversity in desserts so that is definitely a department they need to work on. However coming back to the Volcano, this was the real deal. It was served in flames literally. My picture does show a few flames but I missed the exact moment when it was aflame in a flamboyant style. A real cool dessert that was served in flames. Pardon me for the bad Oxymoron. It had a sweet rich chocolaty flavor. 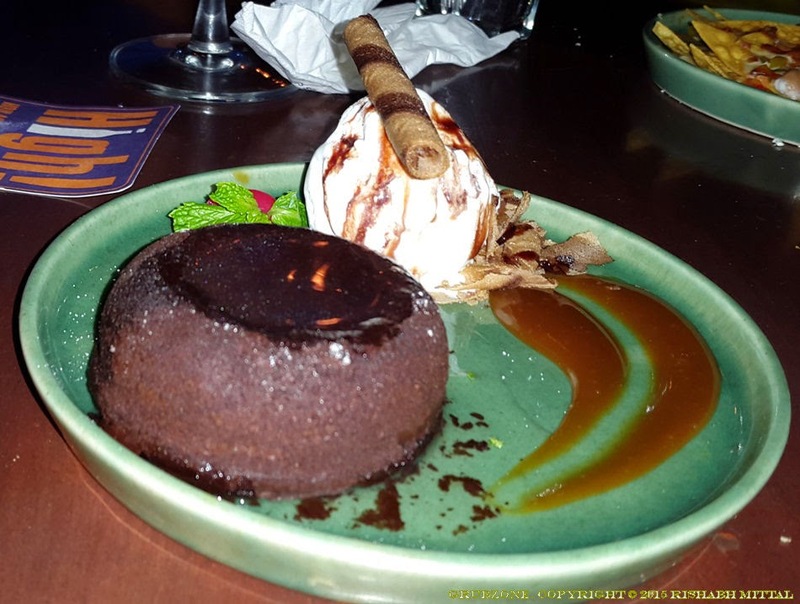 And as is tradition with such desserts - one has to have the Cake, the choco lava within and the gelato in one bite. Only then shall the circle be complete and you will taste the real dessert. This Dessert was one of the most memorable food experiences that I have experienced. Captain : If we sail around the Chocolate lava and through the caramel straits, we will end up at the Gelato mountain. Crewmate : You just translated Navigation into food language. Are you well Captain? Captain : And then we climb the mountain and reach the wafer straw peak. Crewmate: Ah right, dessert high...again. The service at Harry's was excellent and our server Dilip was balancing things pretty well. We did keep him busy between serving and explaining the dishes. The service appeared great at all other tables in a crowded pub. Since this was a meal on the house, I really cannot comment on the pricing. However, I will go by the menu for objectivity's sake. The pricing tends to be slightly on the higher side but the food and the pub experience are worth the money. Harry's provided a great experience and it was leagues better than what I have experienced in many other pubs and lounges. To sum it up, Harry's mostly had positives. The few negatives being the extreme loud music coupled with people cheering IPL becoming a bit of a conversation killer and the lack of a dessert diversity. "All right lads, the night is young and we are full. Set out sail and sing down the grog. Until next time." The sea roared as the night set in. My ship sailed along the coast and I was glued to me looking glass. I was spying the land for a good grub zone. Then suddenly me eye caught a famous place that I had never been to. I ordered the crew to dock in nearby. Pizza has always been tis' Captain's favorite and a Pizzeria is always an easy winner among choices. As the ship came to a halt, the delectable aroma of pizza was already calling me to it. Just like a siren, who calls on lovelorn sailors in the North. It was a chance encounter of some sorts. I was in this part of town and just came out of a Jeffery Archer book signing session. While passing Marine Drive, I faced a lot of big name restaurants that I had always wanted to go to. And there stood Pizza by the Bay. It was dinner time and I had a craving for pizza. What better chance I exclaimed as I marched in. 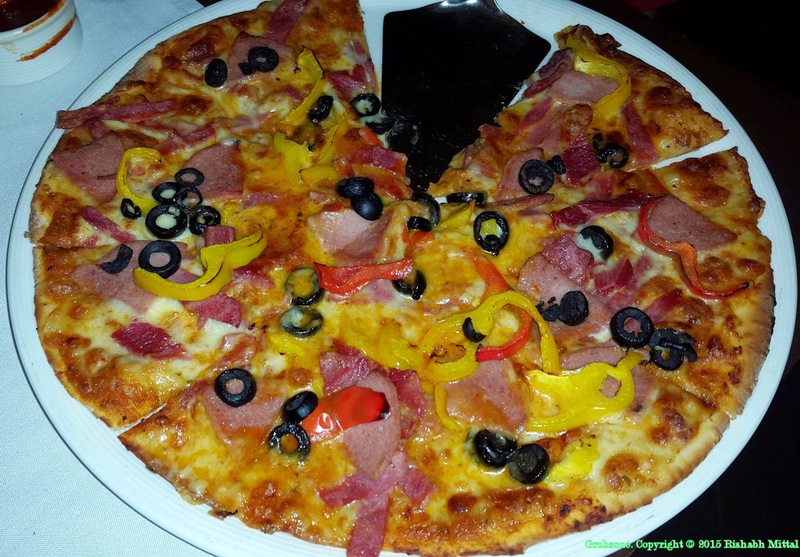 Pizza by the Bay has a spectacular Al-Fresco which faces the sea and the busy marine drive road. It is quite a sight to see during breakfast and serves as a nice meeting place for friends and office folk. The indoors are equally impressive. Although small in size, it has a pleasant and simple appearance. When I write simple, I mean the comfortable kind of simple. One could close their eyes and relax with their drinks. The wall of jazz as I would like to put it is a wall with many pictures of Jazz Legends. If one is really imaginative, one could close their eyes and hear them playing. Which could also be a side effect of too much wine. Due to the constant Hunger Pang sorties in my stomach, we wasted no time in placing the order. Frittelle Di Formaggio Doppio is a delicious vegetarian starter that pleases both carnivores and herbivores. It uses two kinds of cheeses - Cottage Cheese and Cheddar. These are wrapped in bread crumbs and sprinkled with Mediterranean spices. The taste is addicting and one could easily get mesmerized into Cheeseland. 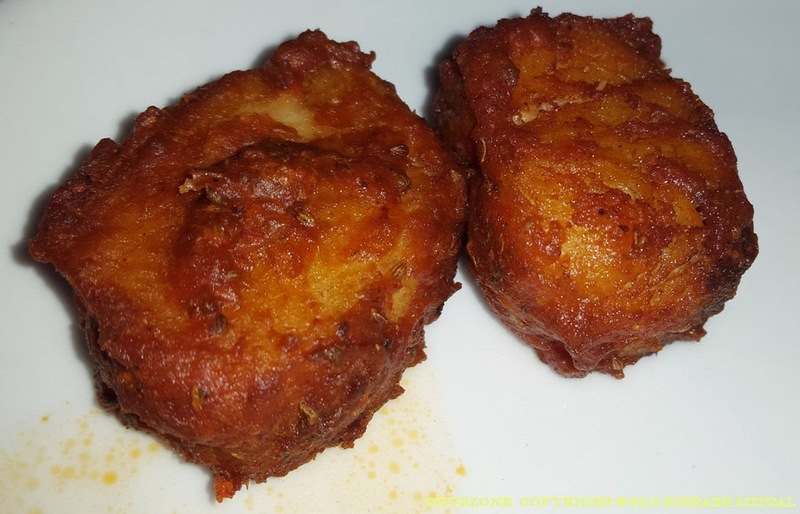 These Cheese fritters are some of the finest that I have ever had. These are served with a generous amount of Fries. The item wins on both plating and taste. Captain : Oi, save some fritters for me too. Crew mate : But I just had one Captain. Captain : How greedy of you lad ! 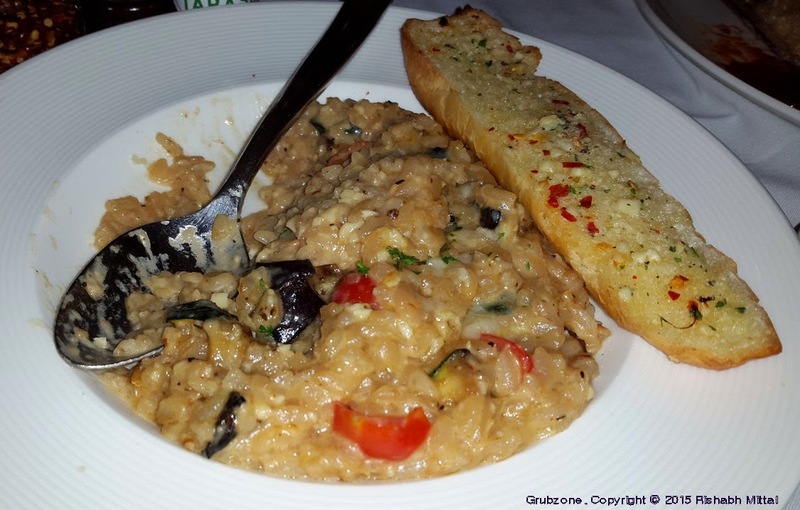 Risotto Siciliana is an atypical Risotto which mystifies you with its appearance. Despite not being served with a typical disc like shape, this is the real deal. Thankfully, it is made with genuine Arborio Rice and not long grained Indian rice varieties. A real Risotto must always use Arborio. The smell and flavor both suggest a strong presence of Garlic. Its cooked with butter and cheese which gives it a smooth-slippery texture. The dish also contains plum tomatoes and eggplant. Overall, a strong flavored dish. This is available in three variants - The plain one for the vegetarian types, the chicken variant and the shrimp variant. Captain : Now this is how a good rice meal should truly taste like. Crewmate : Maybe we can ask the ship cook to make this sometime. Captain : My ship has a cook ?! Pizza Mista reminds me of a famous Chicago pizza chain by the same name. But forget the name, the pizza is an excellent meat craver's pizza. It has an appearance that is reminiscent of a temperate forest in autumn. The colors are vibrant. I haven't seen a pizza plated in a prettier manner than this. The pizza gives out a distinct aroma of Ham and bacon along with the spices used in it. It is loaded with Ham, Bacon and Salami shreds. To provide balance, it has just the right amount of olives, red and yellow bell peppers. Each bite is almost an otherworldly experience. With each bite you get the meat, cheese and olives in your mouth. Its perfect. Also to add, the pizza is not too oily. Captain : Would you look at that? Islands of meat sit on a sea of cheese. And there are nice little bell pepper bridges connecting them. Crewmate : That was profound and cheesy in the literal sense. Ever considered being a food writer? 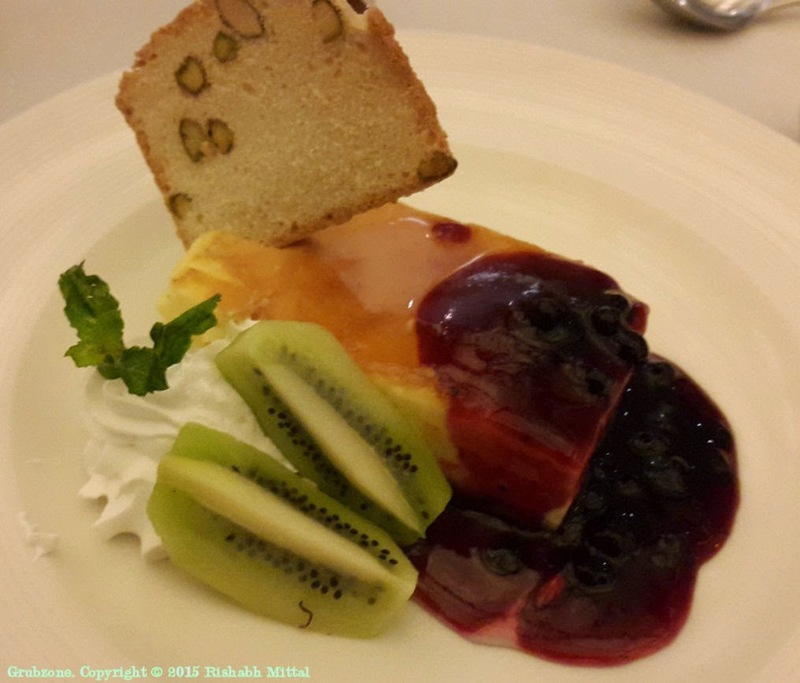 Baked Citrus Cheesecake was a regular cheesecake coated with berry compote and served with some seasonal fruits and whip cream. Though satisfactory, I will say that I have had better cheesecake. Surprisingly, Panna Cotta was missing from the menu but that is no biggie I guess. The Service is one of the better features of Pizza by the Bay. They are professional, polite and diligent. They did not err even once. I rarely see service equal to this, let alone better. The pricing could be on the higher side. Although, such is expected from an eatery on this side of town. The experience is completely worth it and the fact that the restaurant has done roaring business for ages is a testament to that. If you are in Mumbai, then a trip to Pizza by the Way is a must. For the food and for the experience. "Back to the dark seas must we go to, on towards destinations unknown. We shalt be back someday but for now we must sail on."